I frequently drop by HBC stores and I love that their sale periods include bestsellers. This week, HBC is offering great discounts on Beauty Exclusive products like San San, Hortaleza Professional, Allue My First, Body Recipe and Hortaleza,M.D! 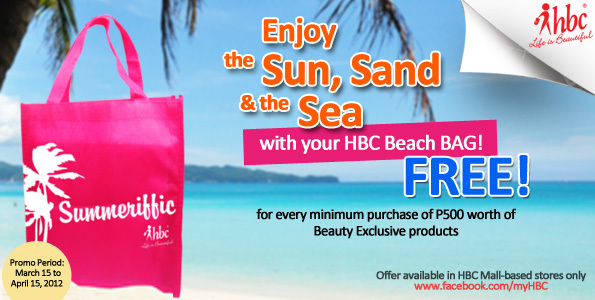 Aside from the mark down, a customer can get a chance to take home a FREE HBC Beach Bag for every P500 worth of purchase. The promo is available in all HBC mall-based stores only, from March 15, 2012 to April 15, 2012. Visit HBC this pay-day and get your fave products on bargain! Disclaimer: I am in no way connected to HBC nor am I being paid for this post. Sale updates are sent to me via email for promotion's dissemination purposes only. Sana kasama sa sale yung san san matte blushes, thanks for the info.